You do not have to have any prior electrical training to complete this course – it’s open to all! 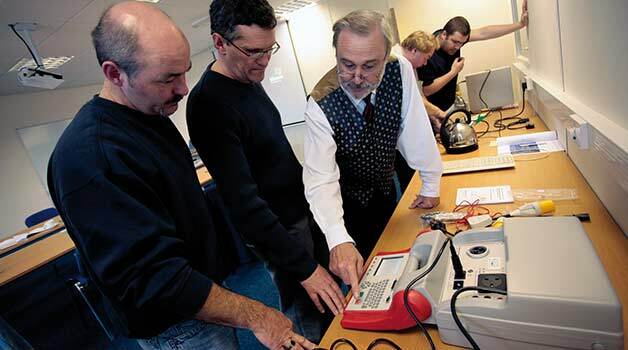 Taught by our team of professional expert tutors, our Leicester PAT training course combines both practical and theoretical elements to cover all aspects of PAT testing. During the course, participants will have to demonstrate their practical skills in front of an industry professional, who will offer guidance and advice along the way. Course lectures cover many different aspects of PAT testing, including principles of electricity, health and safety, legal requirements, the IET Code of Practice, recording results and proper test procedures. Refreshments and lunch are provided throughout the day. To complete the course each trainee has to take an examination. This exam contains 20 questions that cover all aspects of PAT testing. Students will also be graded throughout the day on their practical abilities. When the course is completed to a sufficient standard the Certificate of Competence is awarded. This qualification is officially recognised and shows that a practitioner is fully able to perform PAT tests professionally. The one-day course begins at 09:00 and finishes at 16:00. Although no previous qualifications are required in order to complete the training, participants are expected to study and work hard throughout the duration of the course. Although students on the course are not required to have any previous qualifications, it is recommended that they study the IET Code of Practice to increase their knowledge of the subject. Reading the IET Code of Practice will increase your knowledge of the subject, but it’s not a requirement. The handbook that is provided free of charge during the course covers all aspects of PAT testing. Interested in learning how to safely test portable appliances for safety? Our Leicester pat training course is available to everyone; you don’t have to have any prior electrical training to take this training! This course is ideal for those with their own business who would like to learn how to PAT test their own equipment. It’s also ideal for learning how to PAT test with the aim of starting your own PAT testing business. Our PAT testing training is taught by our team of accredited industry professionals who will guide you through a mixture of practical and theory-based work to develop your understanding of PAT testing and how to operate testers safely and correctly.